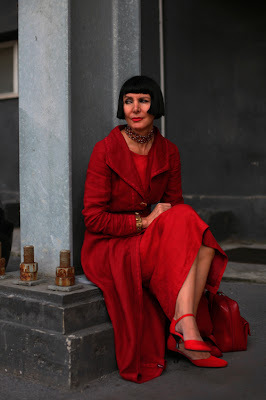 Comments on "On The Street.........Composition in Red, Milano"
xOooh...I love the red she's wearing. And the bob looks fabulous on her. exquisite, both the shot and the subject. you are madly talented. gorgeous! such drama, i love it. does anybody know who this woman is? Wow. Amazing color in this photo. She even makes those big rusty bolts in the steel column seem elegant. She wears that haircut very well, too. Is it a picture or a Hopper portrait? Her sense of style and personality are amazing and timeless. What an exquisite photogragh. The red against grey is breath taking. Even though I don't know this woman, I would put this photo on my wall. what an amazing-looking woman. she looks like a gypsy from a Wes Anderson movie played by Angelica Huston. Or maybe a Tamara Lempicka's portrait? Spectacular! Scott, you have really captured the colour here in this photo. Amazing. I feel that if I spent an evening alone with such a beautiful woman in red, I would end up either jailed or dead. So let me just say that I find this photo very intriguing, and leave it at that. This woman is magnificent, and she knows it! Yes, lots of drama! She's really pulled off a difficult look. Kudos particularly for the hair. This would make a fabulous painting. The colours are rich and vibrant. "Composition in Red" is right! she looks gorgeous - i love her hair. the red on gray is fantastic. Unblievable portrait but if this is a shot of someone you really met on the street it is one of the most amazing pictures I have ever seen--and that is before one even gets to the outfit. I am speechless about the whole thing. Scott, I like the way you composed this shot. It's beautiful. The light reminds of Caravaggios and the color, of Manet's The Fifer. I feel that this photo speaks more to your photography style than to the style of the subject. I get a sense of the direction of the moment. The exact presence of the subject in a particular state in a particular moment, captured 'just so' by a knowing eye. Of course she has great taste also, but in person I am not sure it would be quite as poetic. did she pose as such for the picture, or this is a snapshot?? What I love best is that she's not too precious to sit on the base of a post and lay her handbag on the ground. If I could, I would wear that entire outfit, including the hairstyle, every day for the rest of my life. It is perfect. Thank you for sharing it. She looks like a painting! Thank you for the moments of beauty. truly, she has some old world class. and good job, sart the photo is great. what impresses me most though is how seemlessly she pulled off wearing red from head to toe if five distinct shades. they are all slightly different reds. on most people this would be a disater for the eye, but on her it is absolutely perfect. plus, she just looks like shes got some stories to tell, but, being a lady,they're secret. Shocking red -this picture,even her lipstick is the same red.Naturally her hair color is not her own.The black is ok since there is so much red.I also understand that she has so much make-up on-it is essential for the heavy coloring.But I´m not particularly fond of this shot. It is too colorful,too much`made´.And I don´t like her haircut. we didn't speak, i just got her attention, motioned to the camera and took the photo. It's an Italian Louise Brookes in fantabulous red!!! Like a Dutch realism portrait - PERFECTO!!!! your talent is just getting out of hand. the photography here is always stellar, but honestly, something is going on with you lately that is just almost kind of thrilling to witness. this shot, the one of the beautiful red-haired model on the bike a few days ago...damn, you are really on a roll. This is like those gorgeous portraits by Whistler - he'd title it "Symphony in Scarlet and black". She looks great and the outfit is stunning but it's the photography that turns it into art. I would hang this photograph over my fireplace. Her coat is perfection. But then, it all is. She is. I want to know more about her and -- yet! -- perhaps she isn't real. Or she's too real. Or something. Winking -- what does she know? This picture is really amazing (and I never comment anything...). such a painterly photograph. well done. It´s the first time i visit your blog! It´s great, congratulation!! i´m very interested in photographs (i´ve recently bought a canon reflex) and in the fashion around the world as well because we represents fashion brands here in Portugal. If you´re curios visit our blog to take a look. They are becoming a success here. Lots of kisses, successes and great photos! Utterly breathtaking. this photo tells a thousand stories. Sartorialist, you are a genius. When is a major museum going to give you an exhibition? drama-queen! amazing picture (and amazing motif). W.O.W! This is much more than just style. Congratulations for sucha a shoot. Who is this being? She looks amazing, like she had just stepped out of the 1930s! You have managed to capture something so deep in this picture that it brings tears to my eyes. I find myself thinking of the portrait of Dorian Grey. I see so much beauty in this picture, noble but fragile beauty. This is so amazing. I can't add much to what everyone else has said, but just wanted to add another "Bravo!!!" to the chorus. This is art. Oh wow. How dramatic. That coat is simply divine. She is from another world. Love the bold colour and the bold styling of her bob. Congratulations Mr. Schuman, it seems you have transcended your status. This picture tells more of art than fashion. Love to know more about her !! Majestic! She looks like an ancient Roman patrician! All of your photography is digital, isn't it? I have been meaning to ask that for months and months and now I can't resist. Is there one camera (if it is in fact digital) or film stock that you normally shoot? And how did you learn photography? she's great. Dunno who is she, but I know from whom she took inspiration. Valentina comics by Milan's based artist Guido Crepax. sart, i've seen you do some great things with a camera but this...this looks like you did it with a paintbrush. the fact that it was extemporaneous pulls it out of the realm of "arty" and way, way into just plain Art. You always come across as such a humanist in your shots, and even in this classic beauty you can see that. Thank you for your work, truly. Wow - I really love this woman, and as heart-stopping dramatic as she is, she's not over-the-top or too "fashioney." And this is such a great shot, the perfect complement for her look. Drama without pretension. You really outdid yourself on this one. So beautifully composed and captured. It's not about the clothes, it's about the moment. ON THE STREET?? ?After an appointment , I think! Could you have ever taken this anywhere but in Italy? Cultural presence remains strong. This photo has strong ties to Italian painting. (You have done the same thing with certain of your Northern European photos, which show a strong resemblance to Northern European painting). It's not just a matter of color, but light as well, I imagine. this is painted! painted beautiful. I love the composition of this image. The textures remind me of a painting. She looks like a fabulous supervillain spy taking her lunch break. Fantastic! She is mystery, and and that's the highest compliment that one can pay a woman. Sincerely, she's wrapped in red and has a distance to her that can only be attributed to an intimate understanding of mystery. Catherine Denuve should do so well. "of a certain age" who is ageless, to maximum effect. Bravo to both you and her. Bravo!! My favorite shot yet! You are a brilliant photographer! This picture and the rest of your work certainly attest to that. Such reds - the red of her lipstick, the subtle shading of her face and skin tone, the red of her dress, her coat, her shoes, her bag - it's simply amazing what you've done with this photograph. The word painterly is so overused, and a bit annoying now, quite frankly, but forgive me for using it again. This is the most painterly current photograph I've ever seen. It reminds me of some of the lush paintings of the old masters. One, in particular comes to mind - a painting, a portrait of Louise-Antoinette Feuardent by the 19th century painter Jean Francois Millet. I think because that painting seems deceptively simple with not much colour, but seems to be a living, breathing thing. Your picture seems dreamlike, but is infused with reaffirming life in the woman's very stillness. Thank you for taking this picture and for sharing it with the world. And thank you to your subject for existing. This is a beautiful photograph. It really is. I admire that your blog truly captures the style of a person in a high quality photograph. Most street fashion blogs are compiliations of lots of standard, sloppy photographs of scenesters. Your street fashion photography is more of an art form; you look for style in unexpected places. Not only in the young, beautiful, and slender, but in everyone. Kind of reminiscent of Diane Arbus. My god - this could be a painting! this should be a painting. Um, is this a painting? This photo is so isnpiring, I too, want to look like a poiece of art! I love this 'costume' look, very retro yet never out of style.. The BEST yet!!!!!! Bravo Bravo BRAVO, Scott!!! I think she's a journalist. She was on the first row of each show I went to in Milan. "i'm waiting for him, you see...."
we need more sart in the world. in addition to all the below, i love that she does not look like an anorexic botox freak. thank you for elevating the jolie laide into something to aspire to. I have enjoyed the Sartorialist for quite a while now. Congratulations and all success to you. this still is breathtaking. just the sight of the woman; woeven in red is adamantly feminine. purely feminine to say the least, not androgynous what so ever. her feminimity exudes through that dress. I am in awe. Instant classic. Painterly. Devil Wears Prada meets Cruella De Vil. Cool. Agreeing with mexicanfashionista; the first words in my mind: Tamara de Lempicka! wow. this is like a painting. gorgeous. This is like a painting!